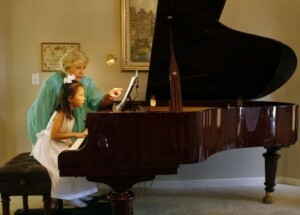 She may only be six years old, but that hasn’t stopped Marrisa Liu from winning the Sonatina and Sonata International Youth Piano Competition in Corpus Christi, Texas with the help from her piano teacher, Judith Fairchild. Initially, the organisers of the international piano competition rejected Marrisa’s first application. The reason was simply because that she was too good for someone as young as her. “They did not accept it because it was way over the level of a first-grader,” said Judith Fairchild. This did not stop the determined Marrisa from trying to apply again. For her second application, her teacher and her decided that they should try out something within her age group. Hence, they decided on going with an easier Chopin’s waltz, which he wrote when he was only seven years old. This time, her second application was successful. Marrisa managed to make it to the grand stage to perform in front of an audience and blew the rest of the competition away. In the twenty years of competition, Marrisa is the youngest so far to have won the grand prize. “It is difficult to play Chopin in a natural way. She did it. Her performance was beautiful and sensitive. She was very, very well received,” said Nina Drath, the competition’s director and the president of the Fryderyk Chopin Society of Texas. Nina also agreed that Marrisa is a prodigy. Her parents are extremely surprise and proud of her achievements. “I feel so happy. I’m so proud of Marissa,” said her mother. “Marissa has her own opinion on how to play the music. That’s a big surprise for me,” said her father. Marrisa also sets herself apart from other pianists by developing her own pedaling technique, which is different from what Judith had taught her. “I think that is another reason why she won. Sometimes being unique at what you do involves breaking the standard rules,” stated Judith. If someone as young as Marrisa is capable of learning to play the piano and excelling in it, then it shouldn’t be an issue for other learners out there. It is critical for one to remain motivated and believe in their own abilities in order to succeed. If you have that strong passion to learn, then you’ll be able to get there in no time. Check out our Piano Lessons For Kids to get your child started!